Student Loans: Modern Day Financial Slavery | New Growth Hair Magazine | We capture the culture of urban barbershops and beauty salons. 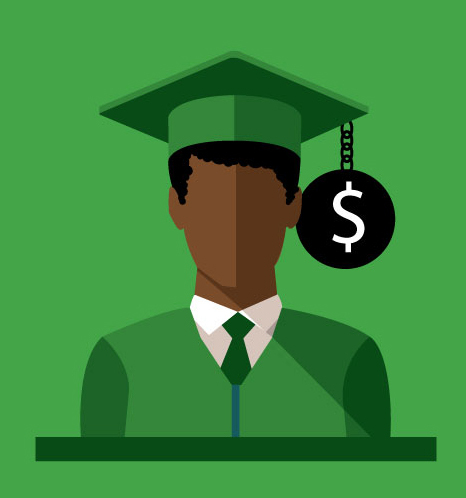 Whether you are talking to recent African American college graduates or old school alumni about student loans, it’s not uncommon to hear them say that they owe between $40,000 and $80,000 for their degree. The college grads share nostalgic memories of the college experience but dread the day when they can no longer defer their student loan payments. Many of these student were encouraged by their parents and grandparents, descendants of enslaved Africans and share croppers to go to college. The college graduates traded-in their grandparents share cropper contracts, profit sharing agreements, and installment land contracts for Sallie Mae promissory notes. Enslaved Africans were debt based slaves because the plantation owners borrowed money from banks to purchase their human chattel. After physical slavery was abolished, the newly freed men and women had no money, capital, or land to pursue the “American Dream.” So, a large number of former enslaved Africans entered into share cropper agreements with their former masters, a more sophisticated version of American feudalism. The share croppers were legally free but not physically free to leave their former masters until they repaid their debt from their share cropper agreements in crops and labor. Fast forward to 2016, let’s replace the word master with employer and share cropper with employee. The employer (master) won’t hire the employee (share cropper) until he or she obtains a college degree. The employee is legally free but not economically free to leave the corporate plantation system until he or she repays $50,000 in student loans. The employer’s compensation plan provides the employee with enough money to cover housing expenses, transportation, food, entertainment, and healthcare but not enough to repay the massive student loan debt. The employee isn’t free because he or she is a modern day financial slave in a revised and improved American feudalism system. According to the Urban Institute, the total outstanding student loan debt equals $1.16 trillion and 40 percent of the loans belong to African American students. Recently, The Federal Reserve (St. Louis) released a report that showed that college degrees have increased the net worth of every group in America except for African Americans. The median net worth of African Americans with college degrees is $32,780 compared to $359,928 for whites and $49,606 for Latinos. Our ancestors didn’t survive the Maafa (The Trans-Atlantic Slave Trade), The Civil War, Reconstruction, Jim Crow, and The Civil Rights Movement for us to be proud educated financial slaves buried in student loan debt. We must teach the next generation to consider low cost educational opportunities (such as community college and trade school) and entrepreneurship training. Before students enroll in a college or university, they should pick a degree with a career path that provides reasonable economic opportunities to repay their student loan debt. We must rethink, revisit, and reevaluate all systems that prohibit our community from becoming economically empowered.